Some areas of clock restoration are more specialised than others. The entire process is a delicate one, and requires master craftsmen to achieve authenticity in a restored antique clock. I have access to specialist craftsmen for wooden case repairs. They can expertly restore the case of your clock, so it looks completely original. 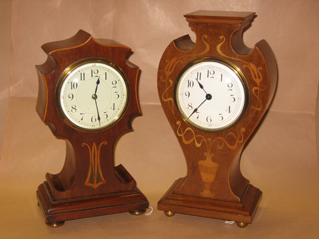 Professional antique clock case repairs in North Kent. Once your clock is restored I will happily deliver it to you to ensure a safe journey. I will also set up your clock correctly for you.